Pathogenesis of SSc: integration of vasculopathic and immunological processes leading to fibrosis. The pathogenesis of SSc is initiated by microvascular injury (i). 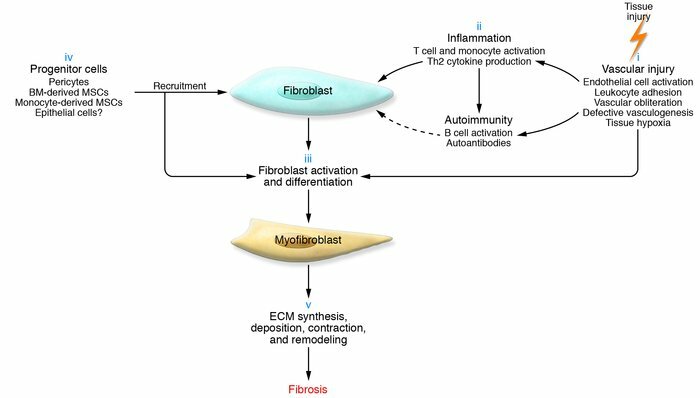 This induces inflammation and autoimmunity (ii), which have direct and indirect roles in inducing fibroblast activation (iii), a key event in the development of fibrosis. The number of fibroblasts and their precursors in affected tissues is increased by trafficking as well as by the differentiation of mesenchymal cells (iv). Activated myofibroblasts in the lesional tissue perform a series of functions culminating in fibrosis (v). MSC, mesenchymal stem cell.